Rich Gwaltney from Transitions Life Care spoke about much more than living wills and health care powers of attorney on February 20, 2016. In fact, he focused on FIVE WISHES. 3. How comfortable do I want to be? 4. How do I want people to treat me? 5. What do I want my loved ones to know? The presentation and the slides are archived on this site. Click on SLIDES, to open up the slides in a new window. To access the audio recording, click on TALK and then download. (This is a large file and may take a while to download). You should be able to return to the slides window and follow along during the audio presentation. Since the entire presentation is an hour and 20 minutes long, you may want to engage it in sections. The CHART provides a guide to slides and audio sections. 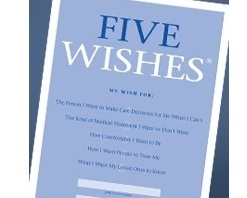 Download a sample copy of The Five Wishes Document, Unfortunately, because of the watermark, the document is not considered legal. A legal form of the document can be ordered online. Plan a discussion with loved ones about your preferences regarding medical care should you become unable to make decisions for yourself. Churches have a different role in the lives of older people than social service agencies.